I was a little apprehensive approaching tonight’s venue The Boardwalk, Sheffield. 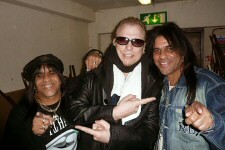 We were at the Manchester Apollo when Schenker hit rock bottom (excuse the pun) whilst on tour last year with the Scorpions. Even his die hard fans booed him off stage; modern technology meant the horrendous drunken performance at a Rock ‘N Blues festival would be on You Tube for the whole world to see. Manchester Apollo was equally as pathetic and a complete disaster. We decided not to review the concert back then. 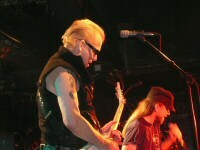 Even though the Scorpions were phenomenal Michael Schenker was already down and in need of help, not another slating. This small club tour was definitely his last chance saloon. We spoke to many fans who also saw last year’s antics but were here tonight to see if the real Michael Schenker would please stand up? I’m still wondering if he’s gonna show up at all as lighting technician Fez told us he didn’t come to the sound check. 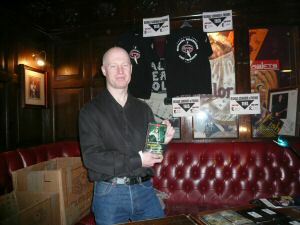 It was Adrian on the merchandise stall that we put under the spot light to find out why Michael hasn’t showed up? “Michael is here but is turning up to gigs 10 minutes before the show and leaving straight after back to the hotel”. We didn’t realise that the guy on the merchandise stall (Adrian Fisher) was the master mind of this whole Schenker come back tour. He took over booking agent duties and seems to have Michael back on track. 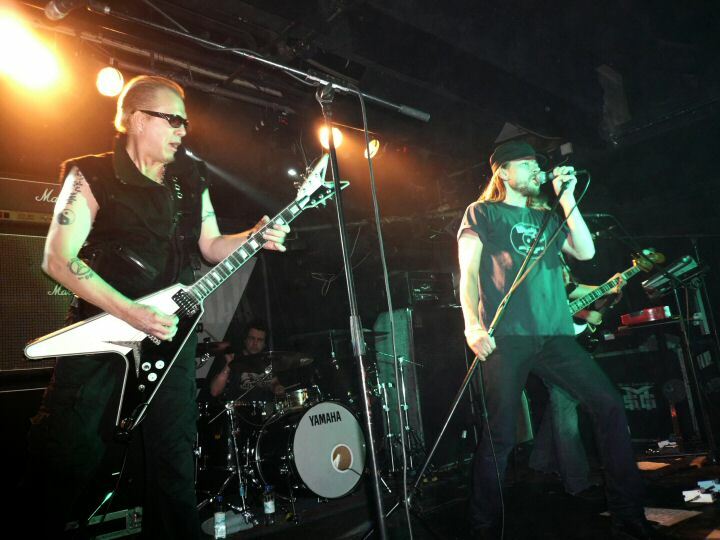 The need for funds for this tour was never more evident than when you saw Schenker’s old personal VHS videos on sale. The cover says - The making of the new MSG album - “The Unforgiven”. 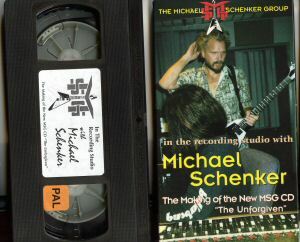 (1998 quite old then) From what I’ve seen it’s poorly shot home camera footage of Schenker in the studio. It does give you a raw look at the man at work and occasionally at play but in a world of DVD, HD and Blue Ray it seems like it belongs to the caveman era. I actually purchased one after the gig just to support the guy. I felt it was the least we could do after the contribution he had given to the music scene. Adrian kindly contacted Michael’s tour manager to let him know we were here and thanks to Ade and Michael’s girlfriend Emi we got another brief encounter with a true guitar legend. You can see by this exclusive back stage picture he looked relaxed and happy. We can confirm Michael Schenker is on the wagon and looked like the same shy German guitar maestro we first met as fans in the early UFO days. This is the man who inspired me to commission Pete Bach to build me a flying V, (back then Pete was making guitars for Thin Lizzy members etc). 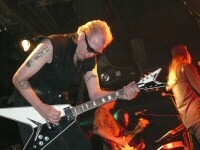 A black Flying V with a white scratch plate, I had Schenker’s name across the head stock. That’s how inspirational Michael Schenker was to me personally as a young musician. I left Mick at the side of the stage to grab some live photos. I had to wade through a packed Sheffield Boardwalk to get to the bar. As a huge roar erupted I turned round to see Schenker salute the fans, it’s show time as Assault Attack is unleashed. By the time I got served the band and fans were all singing Are You Ready to Rock? Let It Roll was up next and what a version it was; that beautiful part of the guitar solo when it slows down and Schenker takes you on a melodic journey, gliding across the guitar neck and pulling out those note bends that make the hairs stand up on the back of your neck. Was it really recorded back in 1975? The old fart sad answer is yes, on the Force It album. There’s a dude to the right of us filming every song I wished we had got his contact details as this would be worth enjoying all over again. This gig will be on you tube and the fans will see for themselves that Schenker is back better than ever. Last year he couldn’t play a note right but tonight he can’t play one wrong. “ Angels of Avalon " from the 2006 "Tales of Rock ‘N’ Roll" album, was well delivered but was like the waiter bringing you the starter. “Lights Out” followed and now we have the ultimate main course. This is the bench mark; can Michael Schenker emulate the UFO classic and do it justice? The uncomplicated answer is yes. The performance was incredible, better than anyone could have expected. We even had the Lights Out in Sheffield treatment from vocalist Leif Sundin who had sung for Michael on the 1996 Written in the Sand album. 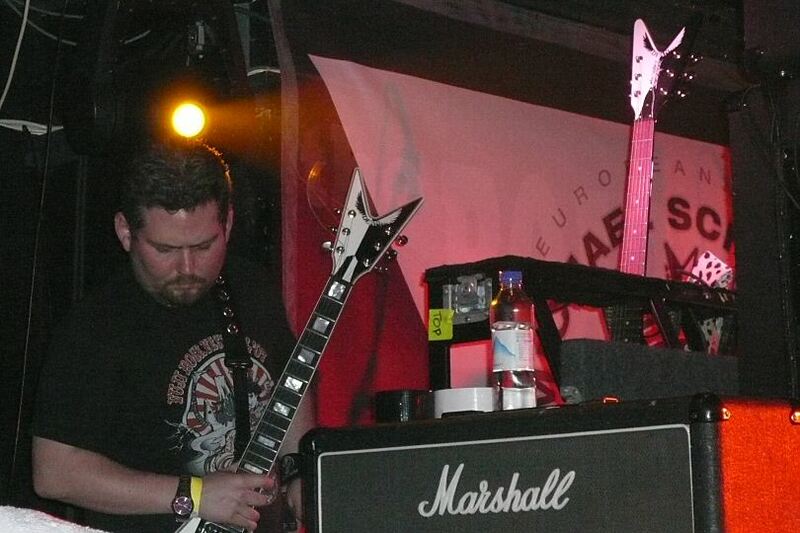 Michael is now playing with Dean guitars and continues to deliver that glorious tone. By now we are stood 5 feet away from Michael at the side of the stage. I’m trying to work out what he’s using as floor pedals? Looks like a Boss delay, Ibanez Tube Screamer, his trade mark half open cocked wah pedal and maybe a bit of chorus? Schenker uses very little effect. His vibrato and melodic phrasing is timeless. He’s using a Marshall stack and having played this venue as a warm up for the Baileys Comet tour we know there’s little margin for error in terms of the amp squealing its arse off like a scalded cat. Michael was in total control, focused and professional from start to finish. He broke a guitar string but just carried on playing before handing it to the guitar tech to re string. You could see his Dean guitar headstocks rising from the guitar rack like an arsenal of armoury; hidden behind the worlds most famous and adored back line, the Marshall stack. Too many times in his career he’s made the headlines for what’s happened off stage but tonight should be remembered for the day Michael Schenker became a born again guitar god. It wasn’t just those UFO classics we were treated to, also On and On, But I want More, Attack Of The MadAxe Man….Schenker has contributed to many classic rock songs in his long career. The band were also very tight. Although vocalist Leif Sundin seemed a little strained he managed to get through the gig. He told us after the show he was very tired and should really be resting his voice (but was at the bar!) 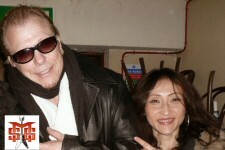 He’s planning on working again with John Norum ( Europe fame) in the near future. Classics like Into The Arena, Only You Can Rock Me were superb and the icing on the cake of course was Doctor Doctor and Rock Bottom. It was like going back in time to 1977 when we followed UFO to Birmingham, Newark and Blackpool in 3 consecutive days (and spent two nights in police cells) but hey that’s Rock’N’Roll. Tonight the fans gave him one last chance to redeem himself and Schenker took it and proved why he is one of those truly gifted guitar players. 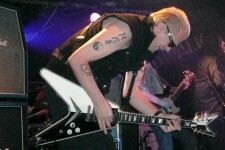 Now I know why Schenker’s name is on my Flying V and why I still have it in my guitar collection 30 years later. 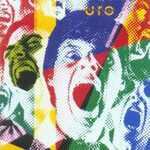 If you have never bought a UFO album then grab a copy of the ultimate UFO experience the 1979 Strangers In The Night live album. We believe the new MSG album In The Midst Of Beauty may come out on the German SPV label but we haven’t had official confirmation yet. For too many years Michael Schenker has been Too Hot To Handle. This tour was a chance to get back to the fans in an intimate environment. There’s talk of a MSG tour with Gary Barden on vocals, Chris Glen and Ted McKenna have also been mentioned so we will wait and see if it happens? All we can hope for is that Michael stays on the wagon. Against all the odds the mad German makes a triumphant return to form and don’t be surprised if you see MSG on tour with the Scorpions later this year. 10 out of 10? No, this one goes all the way to 11.